Smoking wax dabs is quickly gaining in popularity so users want to know the best way to smoke wax. Dab wax weed is a very concentrated form of pot with high percentages of wax thc and other cannabinoids. Medical marijuana wax can be used to treat disease symptoms and pain which are not sufficiently addressed by edibles or regular smoked or vaporized cannabis. What Is The Drug Wax Made Of? Shatter or glass extracts are strong, transparent, clear or lightly colored concentrates that pack a strong punch and must be well-heated. It feels like taffy. Dust is created using dry ice in the extraction method. It has a grainy consistency and is easy to melt. It can be an easy choice for twaxing a joint. This is a form of wax created using the safer, cheap, and easy Rosin Tech Method of pressing pot trim folded in parchment paper with a flat hair iron and scraping off and collecting the concentrate cannabis stains produced. 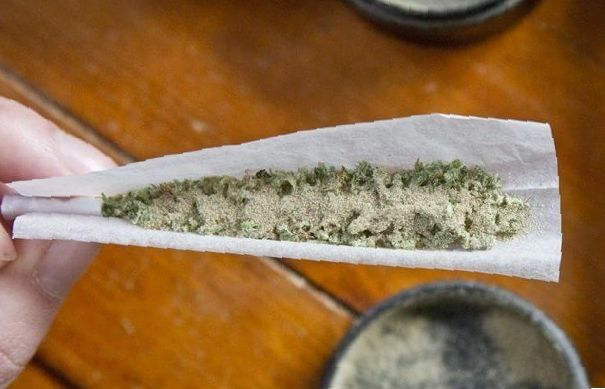 It can be smoked using any method including twaxing in a joint. Budder has the consistency of butter, hence the name. It tends to look like peanut butter. It is often created using butane extraction. It can be used with any smoking method. All concentrates are sometimes called wax or dabs but a particular type of concentrate is also called wax. It looks like beeswax or earwax. It is good for use with an oil rig but can also be used with other methods. Dab oil looks like other cannabis oil but is far more potent and intended for use by smoking rather than edibles. This is one of the purest and safest forms of concentrated cannabis. It is extracted using cold-water and thus not exposed to potential contaminants. It has the consistency and look of sand and can be consumed using any of the discussed methods. Scissor concentrate comes from marijuana operations that involve handling and cutting the leaves. Concentrates stick to the scissors and hands of workers and are collected. This produces a sticky extract high in concentrated cannabinoids. The most popular way to smoke wax dabs is with an oil rig. 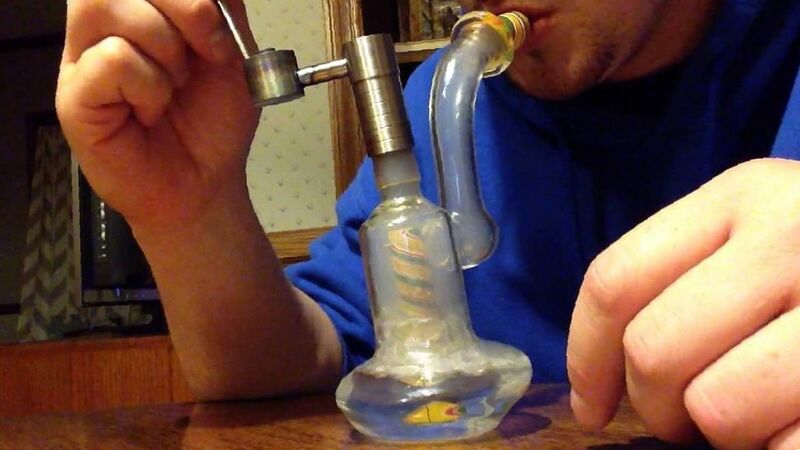 The oil rig is a water pipe which is modified by adding a nail and other dabbing accessories. Attached to the intake of the water pipe is the nail, which is made of titanium or quartz. Newer titanium nails are circular with a hole through the middle where the dab smoke will be received, surrounded by a moat where the wax is applied after the nail has been heated with a torch (older nails required a dome over the nail). Quartz nails are also popular as some say it has a better taste than the titanium metal; however, quartz is susceptible to breaking or becoming damaged by extreme heat and will likely have a much lower shelf-life than titanium. You will fill your water pipe with enough water for a water bong hit. Attach the nail or e-nail to the intake. If you have a regular titanium or quartz nail, use a torch (butane or culinary torch) to heat the nail to red hot for the titanium nail, or use an e-nail and set the temperature to 500 to 700 degrees F. Be careful if you use a quartz nail as overheating can damage the nail. 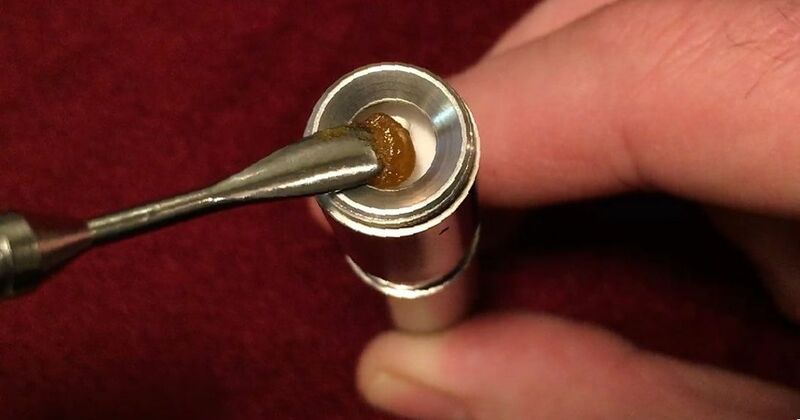 Once the nail is hot, put a small dab on the end of the carb cap and dab it onto the nail (in the moat around the intake hole), being sure not to cover the intake hole with the dab. It will combust on impact and smoke. Then, take a hit through the mouthpiece (you may need to use the other end of your carb cap to cover the nail if the smoke is escaping). You will not need to hold the smoke in long, and you will take a very limited amount of dab hits. Dabbing requires very little dab for a strong and long-lasting effect. It is not like toking on regular weed. The cannabinoids in your dab are very concentrated. A little goes a very long way. When looking for a vape pen, be sure to do your research to find one that works well for dabbing (you’ll need one with a separate atomizer and cartridge). Vaping dabs is easy. Take your vaping pen and disconnect the atomizer from the battery. Take the atomizer and place a small dab on the coil. Turn on the battery chamber, then connect the atomizer to the battery. Connect the mouthpiece and you’re ready to take a dab hit. Draw in slowly to make sure you get the necessary amount of heat. 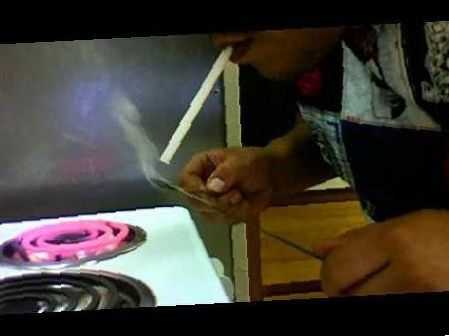 This is potentially a cleaner way to smoke dabs. 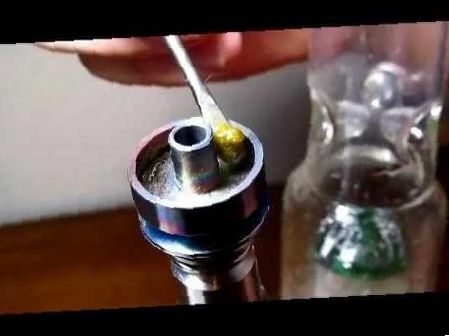 Using a healthstone is a way to use dabs with a bowl. Healthstone is a type of porous glass insert which can be used as a screen for your bowl or glass bubbler. Usage is simple, insert your healthstone into your bowl. 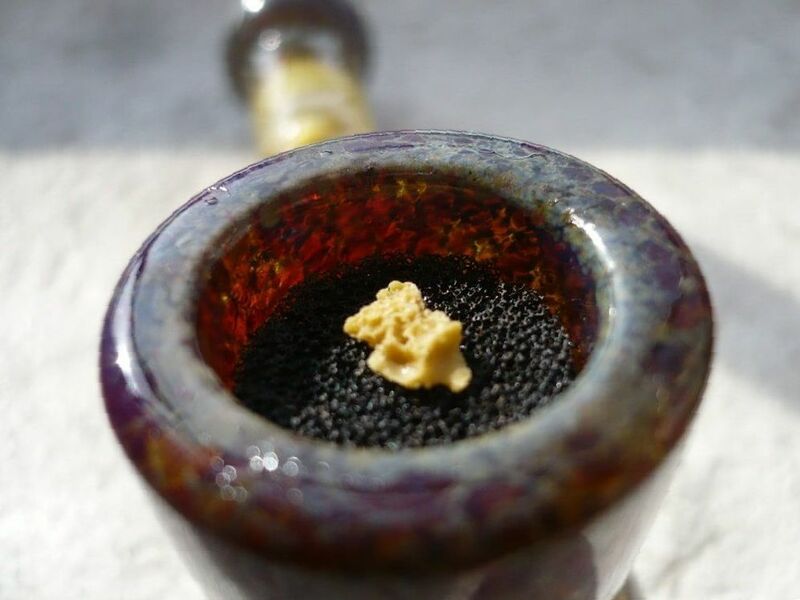 Now, apply a small dab of shatter, budder, ice wax or other form of wax on top of your healthstone. Apply heat with a torch or heat gun until combustion is achieved, then take a toke. Like with any other way of consuming marijuana wax, use in moderation. Twaxing means adding concentrated wax to your regular cannabis bud. This can be done with bowls, bongs, and even joints. 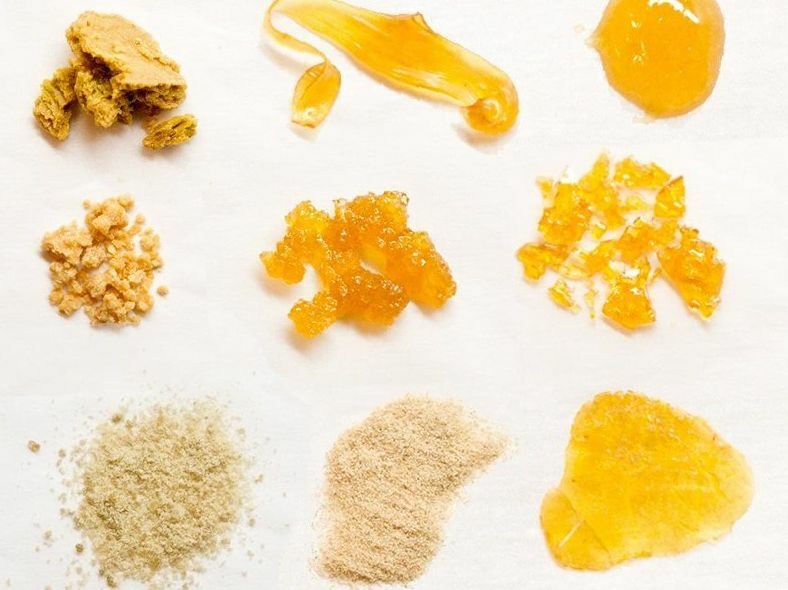 There are many ways to add concentrates to a joint, depending on the consistency of the concentrate. Purer concentrates like shatter are typically heated up to a honeylike consistency if necessary, being careful to use a modest dose. The joint is then dipped lightly in the shatter and pulled away as thin strings form, which can be laid in strings on the tip of the joint or twirled around the joint to make fancy designs. Then the joint is smoked as usual. Dryer concentrates like dry sift and rosin can be applied inside of the joint. Budder concentrates and those of a similar consistency must also be applied inside of the joint. It’s important to dose correctly, it only takes a little to enliven your typical pot with concentrates. When twaxing a joint with concentrates like shatter, be vigilant because that the shatter may melt and drip. Simply rotating the joint will solve this problem. The method of using hot knives is cheap, simple, and easy. It is often used when one has concentrates but no access to smoking apparatus. Simply take a metallic butter knife and heat it on a stove top so that the top is hot and the end is cool enough to hold. Remove the knife to a heat safe surface and place a modest dab on the hot knife. It will combust upon impact and the user will inhale the potent smoke from the wax dab. Since the smoke will quickly dissipate, it will be useful to use a straw, funnel, or plastic bottle cut in half to hover over the smoke and inhale it. No matter what form of wax dab concentrate you choose and what form of smoking, you will get a stronger effect from using concentrates than smoking regular pot. For medical uses, this could be a great boon if you have pain that is not touched by regular weed. Dabs could be the answer for your recreational or medicinal needs. Be sure to be modest. Dabs are very concentrated and a little goes a long way. 1 What Is The Drug Wax Made Of? Who in the hell is giving out free grams of wax it’s not like getting a gram of flower.